Bandsaws are the workhorse of the workshop and I was brought up on Record tools, so I was pleased to be able to test drive the Record BS350S. I had become interested in the Record range last year when looking for a new bandsaw for my small workshop, but only held back from buying one because someone gave me a bigger, second-hand saw! The BS350 has been upgraded and improved, and sports a bigger table, a more rigid fence, cam lock tension adjuster, and some very easily adjusted guides and thrust rollers. The table is 550 x 500mm (21 9/16 x 19 9/16in), has a polished surface and very usefully has T-slots milled on both the left- and right-hand side of the blade. The blade changing slot is covered by a rigid bar on the underside of the table, but undoing a cap head Allen bolt allows it to be pivoted out of the way. I have a slight niggle with the fence mechanism because one has to use the Allen key again to remove the fence from the table if you want to make use of the full 340mm (13 3/8in) throat. I do like to be able to take the fence off and set it aside when not needed. When the fence is fitted, you can rip a 270mm (10 3/8in) width. The table tilts to 45 degrees and is supported on cast trunions and moved by a very easy rack and pinion gear, which makes fine adjustment a doddle. Whilst we are looking under the table, there is a geared adjuster for the thrust roller. Thrust rollers are so often ignored that it is really great to have one which is so simple to adjust. Above the table the guides and guard is again, rack and pinion geared with a positive lock nut. Guides are easily accessed for adjustment and simple to use. Throughout this machine, the adjustments have been well thought out. 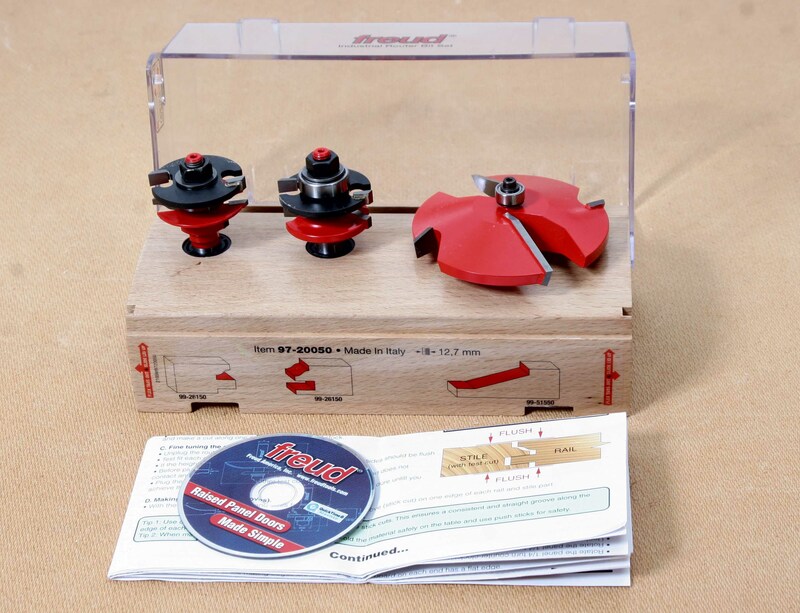 A stand is provided and at the present time, a free wheel-kit is offered. 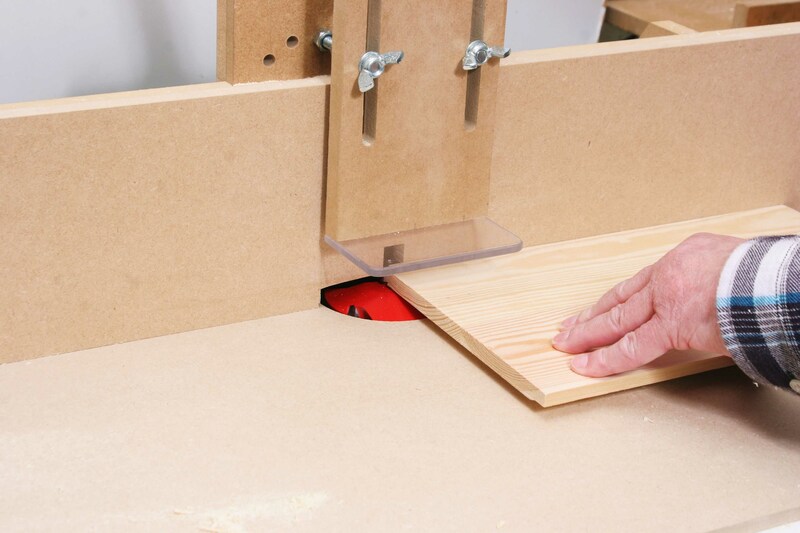 Our test model didn't have the pedal wheel-kit and I think it would have made my life easier as although a handle is provided for moving the saw around, it is a bit on the heavy side for one person. There is slight flexing in the stand and it would be nice to have more substantial sections but at this price, I don't see how it could be done. 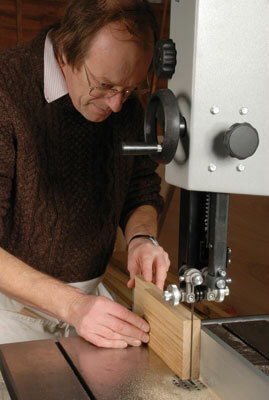 I put some 100mm (4in) English oak through the saw to cut some tenons and it coped well. 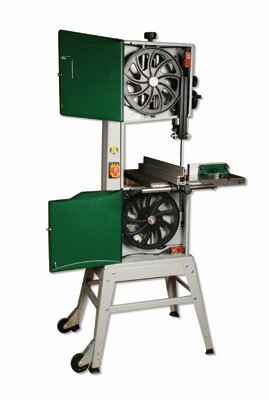 This is a fine little saw that is easy to use and easy to maintain. If this machine falls in your price range, it is definitely one to consider very strongly. It is also worth noting that Record can supply custom made blades for those that want different tooth patterns. Finally the BS350S has a baby brother, the BS300-X which has a 204mm (8 5/32in) depth of cut. The components are very similar but the motor and cutting capacities are slightly smaller. "If this machine falls in your price range, it is definitely one to consider very strongly"